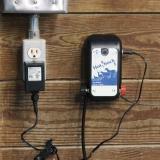 A low-cost 0.5 joule low-impedance electric fence charger which is recommended for temporary, short-length fences for sheep, goats, poultry and wildlife. Also temporary medium-length or permanent short-length fences for cattle and horses. Includes connections to run as either a 110v plug-in or 12v battery (batteries sold separately under accessories below). 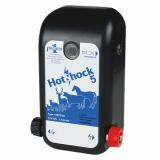 Energizer Kits: HotShock 5 Plug-in Kit and HotShock 5 Battery Kit are available to help simplify your purchasing decision. Use to keep out deer, raccoons and rabbits from garden/orchard areas and keep in poultry, cattle, sheep, goats, horses, and guard dogs. Effective at protecting against coyotes, stray dogs, bear and fox. 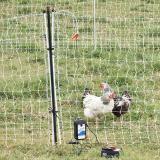 For temporary, short-length fences for sheep, goats, poultry and wildlife. For temporary, medium-length fences for cattle and horses. For permanent, short-length fences for cattle and horses. 3 of the 164' poultry nets. Versatile, can be used as a plug-in energizer or as a battery energizer. Adapts from one style to the other in a few seconds. Easily moved around. Low cost. Insert battery adapter into the HotShock unit. Attach red alligator clip from the adapter to the red “+” terminal of the battery. 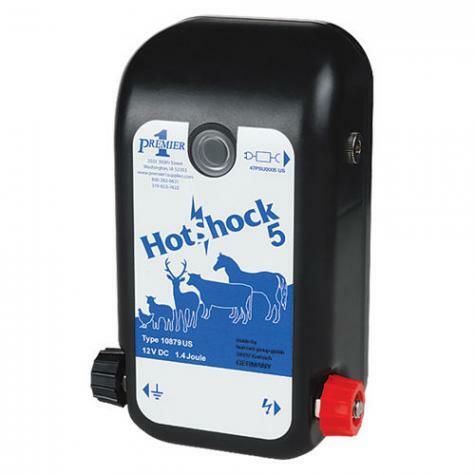 I hooked up the Hot Shock 5 and as I suspected the deer got tangled up in it early the next morning. They seem to be fast learners and now graze outside the perimeter. I'm not sure the apple stuff did any good but I use 1/2 inch tape and with it twisted, it moves in the breeze and reflects. It works great—so far I would highly recommend it and Premier offers great service! I've used multiple brands and types of energizers and this one is my favorite (I own four of them). In my 2-wire fence configuration, I average 4.5kv running off a 12v deep cycle battery and the battery only needs to be recharged about once/month. The indicator light is easy to interpret and the case design is well shielded from the elements. These are simple and reliable. Five stars so far. This little unit is outstanding at charging our new chicken yard. Later on as I can afford it I'll add a battery and solar panel to make it a stand along setup. It definitely is more effective than my other unit. I don't think the frequency of the pulse is as good as advertised. Maybe it's better when used as an ac unit? It doesn't drain my 12v battery nearly as fast as my old unit.